The USB technology is one of the most fascinating invention in the tech world. Many external hardware manufacture for computers are now turning to it as a means for its users to connect the hardware to their computer. But here comes the annoying part, this is the "USB device not recognize" notification you may receive when you plug in your USB device. What can you do to fix this USB not recognize issue? I outline below some possible steps to take so as to resolve the issue. Unplug the USB device and plug it back, if possible on another USB port in your system. Restart your computer while the USB device is left plugged in. If there is a driver disc attached to the park of the USB device, make sure that you install it properly. If the driver is needing update, do not fail to update it. Check that your computer operating system (OS) is up-to-date. This is because with every new version comes an upgrade to USB support. Run an antivirus scan to makes sure that your computer is free from malware. Your BIOS might be needing an update. Check with your computer's motherboard manufacturer to see if there is update for your BIOS. 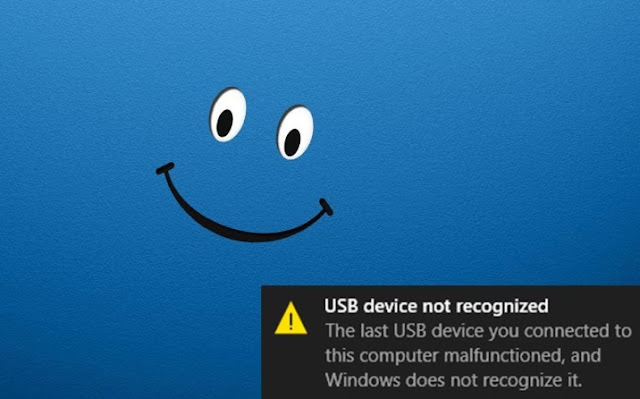 If the USB device not recognize notification persist, then it might be that the USB port of either your computer or that of the device is faulty and needs replacement. Or it could be that the USB technology version of your external hardware device is above that of the USB port in your computer.